Last Sunday week, I’d just arrived at the Snowy Mountains, to be prevented from going into the Guthega ski hire centre, by half a dozen Mountain Operations staff and a cordoned off area. Behind the unusually stern-looking staff, was parked a black, unmarked van with no back windows. “It’ll all be over in 10 minutes,” said the young chap nearest me. But he wouldn’t say what. This was 4:30pm. Then the centre closed for the night. We trudged uphill with our supplies, sans kids’ hire skis, wondering what that was about. Others staying at the lodge didn’t know either. Mention was made of a priest exiting the building. Someone who arrived minutes after us, noted that there was a body in the back of the van: it was the coroner’s van. Bit by bit, we pieced together the story of the tragic death of Michael Meagher. He’d collected a tree on the last day of his skiing holiday. It had been the perfect day, sublime, in fact – clear blue skies, good snow cover and an easy run (Wombat’s). It was all wrong, that an experienced skier could die in such circumstances. The accident had happened at about 10am and was witnessed by a poor chap who’d just bought his lift pass and was on his first trip up. He handed his ticket back and spent the day recounting his horror to police. Luckily, Meagher’s tween-age son didn’t witness the accident, but did endure the agony of watching medics trying to revive him. The family spent the rest of the day with Michael’s body in the ski hire shop. This is no way to end a family holiday. Michael didn’t have a helmet on and it sounded like he did that run alone. It is said that he had a helmet, but chose not to wear it. It is also the opinion of at least one person who saw the aftermath, that the helmet would’ve saved him – but that’s for the coroner to decide, not an untrained casual eye – albeit one that has seen many ski field horrors. One news report says he broke his neck. What we’d heard was that it was massive head injuries. Discussion at the lodge turned to the issue of helmet wearing – should it be compulsory? Some of us, particularly those with younger kids in ski school, chose to wear them for protection (mostly from other less-controlled or inconsiderate skiers and boarders) and to set a good example for the young ones. But, many other skilled riders chose not to and would not change their habits even in light of the tragedy on their very doorstep. The next morning, we weren’t served by the usual young fellow at the ski hire shop. In the village-like atmosphere of Guthega, you get to know the faces over the years. Turns out, the poor young man had acquired a brain injury from a snow-boarding accident the season before and “was no longer the same person.” He didn’t have a helmet on. Mandatory helmet wearing seems like a good idea, but as other blogs note, it could be problematic (read: expensive) to enforce. My personal view is that kids should come with lids for snow sports just as for biking, and while I’d love to see more adults wearing helmets, it ultimately comes down to personal choice and responsibility. Perhaps helmet wearers could get a discounted lift ticket – incentive rather than stick. More enforcement of the Alpine Responsibility Code (read: fine print on your ticket) would also help to reduce many injuries (but probably wouldn’t have saved Michael – assuming it was a single person accident), but that’s hard to do when Perisher had already started letting staff go en masse after the southern states school holidays ended. In the week that I was there, I’d observed that maintenance staff were doubling up as lifties and runs weren’t being groomed daily. This is not a good thing. Thirty-odd boarding instructors had been let go. International ski instructors were told their work was ending weeks before their return flights home. (In terms of staffing, the international reputation of Perisher is on shaky ground at present). I wonder how iron-clad Perisher’s exclusion of liability clause would be, if tested. While there’s an inherent risk in the sport (as in any sport), if conditions aren’t maintained to a reasonable standard, it’s arguably reasonably foreseeable that something bad’s going to happen. Perisher is being run on a shoe-string. Maybe Jamie Packer does casinos better. I do have issues with people wearing headphones or earphones and listening to music while they ski or board – and having them wear helmets doesn’t give them a tick in my books. Full attention on the snow and others around you, or GET OFF THE MOUNTAIN. In fact, more injuries happen through collisions with others than through collisions with inanimate objects. (It’s just that trees are deadlier). Cocky, inexperienced people who ride beyond their means are particularly dangerous. We met several victims in the medical centre this year, who’d been run into and injured by others. The medical centre easily sees 20 knee injuries a day, according to staff, and that’s a happy day when there’s nothing more serious than torn ligaments and broken limbs. We take risks in life, and sometimes they backfire. On the snow, however, the circumstances are less forgiving. Freak accidents can happen anywhere and to anyone, but there are certainly steps that can be taken to reduce their likelihood. What the news reports don’t explain clearly enough, is that the deadly collision-type accidents tend to involve great speed and going off groomed tracks. The other ski field tragedies tend to involve young people not respecting their surrounds. Being invincible at 20-something after a night at the pub with not-enough-clothes-on, becomes the next day’s headlines. While I won’t speculate that this is what happened this week at Mt Buller (because again, it’s for the coroner), it’s happened enough times that it’s tediously predictable. Have fun, but don’t go stupid. Similarly, clueless people of any age, going hiking in the snow (disregarding blizzard predictions) invites questions of what did they think they were doing? And don’t they give a hoot about risking the lives of others who have to go looking for them? Soon before our snow trip, some hikers nearly died on the mountain when they became lost overnight. Unfortunately, after being rescued, they, in their infinite selfishness, decided to go out and look for their gear and got themselves lost a second time – needing to be found, again. I hope they’re charged the full amount of whatever it cost for the two search parties – they owe their lives twice over, plus some. This week, Bill Findlay, a retired Macquarie Uni administrator, was reported to have died of a heart attack during a cross country skiing competition, in the Perisher resort (Guthega is a part of Perisher). While being a dreadful loss to his family and friends, I can’t say that this is a ski field tragedy as such, although it has been reported that way. Presumably, the poor man could’ve had a heart attack anywhere. He didn’t die of exposure or collision. In Guthega, we’d noticed that a black Holden ute had been parked in a no parking area outside the ski hire shop, in the day-parking area for the whole week. In fact, other lodge members noted with concern that it had been there the previous week also and had not been moved. Snow was piled on top of it and no-one knew who it belonged to. In light of the cross country skiers going missing and Meagher’s death, people in Guthega were becoming increasingly concerned. The owner of the vehicle didn’t think to put a note on the dashboard with a mobile phone number or the name of the lodge she was staying at. It was only when word spread that the vehicle was going to be towed that somehow, the owner emerged. It was a person who should’ve known better, someone who worked in the resort, but clearly didn’t have much consideration for other people who not only missed out on parking there for two full weeks, but also who were wondering whether to send out a search party and where to start looking. The snow is a place which demands some respect and common sense. Mindfulness of the surrounds and consideration for others goes a long way towards keeping safe. Beyond that, there’s a certain element of luck that can be present or absent on even the most glorious of days. The mantra on the mountain ought to be: “make it a GREAT run, not the last run”. Because, we just never know. RIP Michael Meaghaer, Bill Findlay and others tragically lost on the ski fields and condolences to the families and friends. N.B. 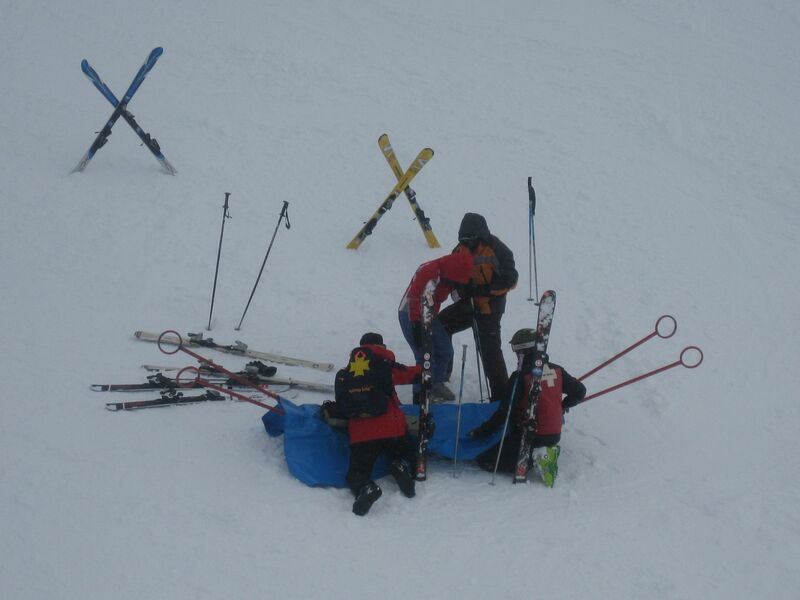 I took the photograph of the ski patrol assisting an injured patron. It was one of 5 accidents I saw that day, but didn’t in any way relate to the persons named in this story. You’re most welcome. While I don’t want to dampen anyone’s enthusiasm for the snow or the Australian snow fields, I do wish safety was taken more seriously. Even some simple safety messages might help, without going as graphic as the anti drink-driving or speeding campaigns. People just don’t think it can happen to them, until it does. Thumbs up for the ski patrol, medics and lifties this year at Perisher. All the staff at the Medical Centre at the ski tube station were efficient, smiling & effective. Our gang have seen them for antibiotic scripts in previous years to an ACL injury this year and they’ve always been brilliant. Keep up the good work.